Personality: Beabulls are extremely friendly and always willing to give kisses and cuddle. Temperament: Beabulls are loveable, even-tempered, easy going, non-aggressive dogs. Beabulls can be very hyper while they are playing. Family Dog: Beabulls make good family dogs. They love little children and don't seem to mind when they cry or scream. Small children should be supervised when playing with a Beabull. Beabulls are mellow dogs, but get excited while playing and may lightly play-bite. Shedding: Beabulls shed a lot. Training: Beabulls respond fairly well to commands and are very easy to potty train. Behavior: Beabulls love to play like a Beagle but have sluggish Bulldog moments. Beabulls love to cuddle and be close to people. 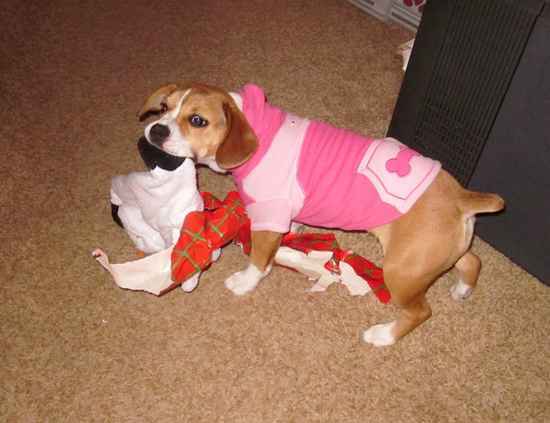 Beabulls are vigorous chewers and can destroy their toys. Beabulls have the beagle obsession with sniffing things. Barking: Beabulls bark occasionally, especially when people come to the door. Weather: Beabulls love to spend time outside in the summer and warm weather. In the winter they may enjoy a romp in the snow and chasing snowballs. Exercise: Beabulls can be pretty lazy, but do love to chew and play tug-o-war. Physical Ability: Beabulls are amazing jumpers. Appearance: Beabulls have the Bulldog wrinkles and underbite. Ears: The ears of a Beabull are not quite as big as a full blooded beagle, but have the same style. Muzzle: Beabulls have very strong jaws. Body: Beabulls have a very strong, sleak body like a Beagle with hips like a Bulldog. Feet: Beabulls have feet similiar to a bulldog. Tail: The Beabulls tail may be docked. Color: Beabulls have a mixture of Beagle and Bulldog coloring. Coat: Beabulls have a softer coat on her sides with coarse, prickly coat on the top of their back. Characteristics: Beabulls are amazing jumpers.